Crawling through rocks, mud and more barely phased the traction the Carnivores had to offer. (Below) The tread tire for any trail, but it works well in all terrains. When we first set eyes on the Maxxis Carnivore, our overly expert opinions (insert sarcasm here) were far too harsh for this tire. 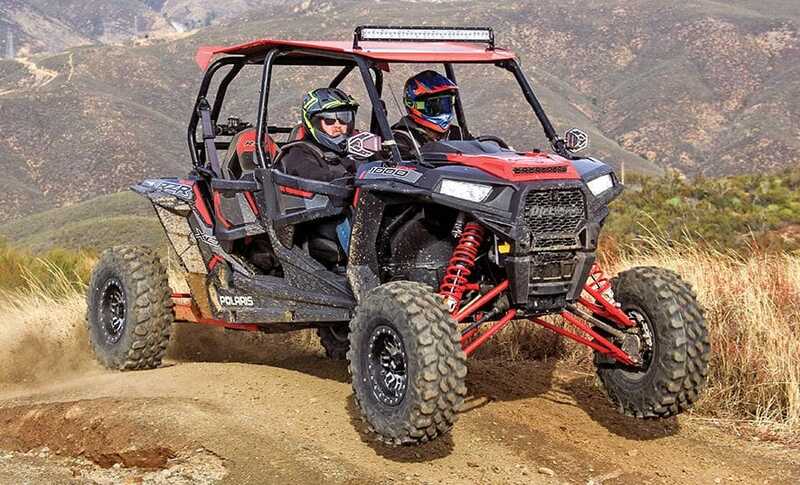 We assumed the tread design would handicap the tire on any form of hardpack UTV driving, while our desert-going crew wanted to turn their noses up at it. We are from the West Coast, where most directions the eye can see are hardpacked and desert-like. The Carnivore had a humbling trick up its sleeve! We left our multiple-terrain tire torture tests very impressed by the Maxxis meat eaters. We shouldn’t have been so surprised, since Maxxis usually sends us great products. This tire looks like it was designed to claw through mud and tacky terrain. The tread blocks are jagged-looking and give the tire more of a flat profile with the tall side lugs. Spacing between the tread blocks allows for a good mud clean-out, yet are close enough together to gain traction on hardpack surfaces. Maxxis claims that the tire has great tread wear, even though the tread is supple and siped. The side wall has protruding tread blocks, which tend to grab traction in rocks and ruts while protecting it from punctures. The carcass of the Carnivore is made using an eight-ply radial construction, which means it is less likely to get punctured while not feeling hefty. The tire is non-directional. You can get this Maxxis in three different sizes: 28, 30 and 32 inches tall. Currently, they can only be wrapped around 14-inch rims. 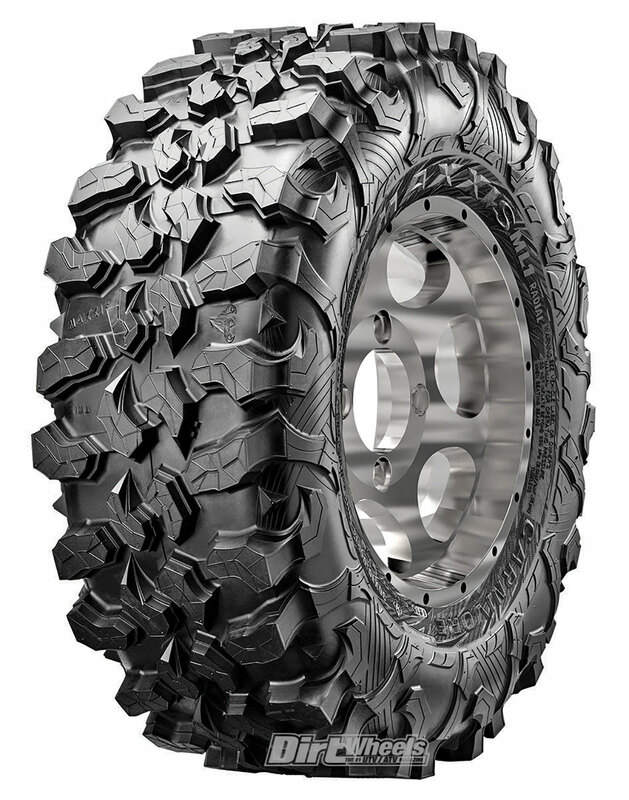 Maxxis’ Carnivore UTV tire is definitely on the aggressive side of an all-terrain design. Maxxis claims that the tire works well in rocks, roots and desert terrains. We simply have to agree. The traction on hardpack was what surprised us the most. Forward drive was strong, and we could still controllably powerslide our machine with only some of the tippy-feeling that tires with large side lugs provide. Since this tire doesn’t have a round profile, we assumed it would not excel in the open desert, and we were proved wrong. Driving through ruts was easy and without too much over-grab. The tire clawed and hooked up through and tracked out corners and through roots. One of our favorite places to take the Carnivores was through rocks. The profile gave us traction all over the place! We plan on driving these tires for miles and miles to see how long they really last. Pricing for the Carnivores ranges from $229–256 each. 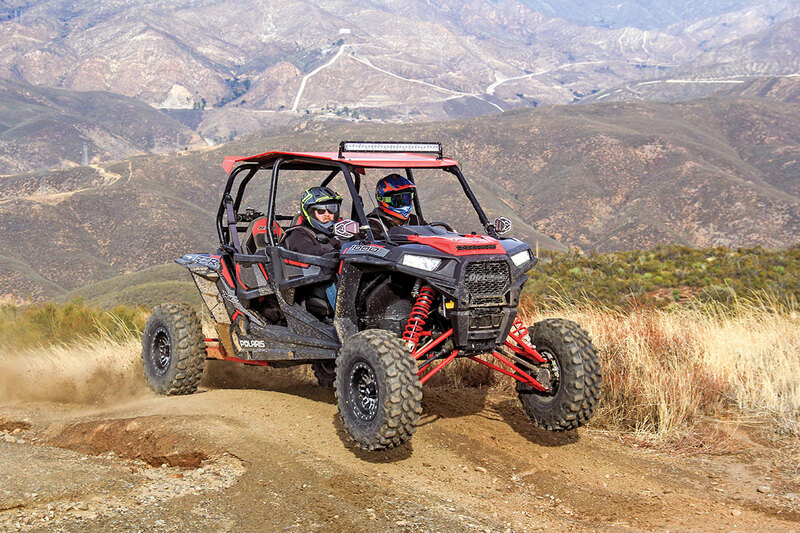 Go check out www.maxxis.com or a local Maxxis dealer to get a good look at their full lineup of tires for ATVs, UTVs and more!